Over the last several weeks there have been some huge developments in the stock market and the economy as a whole. 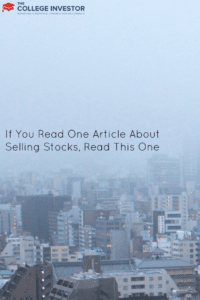 It got me thinking about my investments, and the question that is always the toughest investing question to answer: how do you know when you should be selling stocks? It is so incredibly tough to decide when to sell a stock, but I say that it’s the most important part of investing — even more important than buying the right investment. If you don’t know when to sell, you lose money. You lose money because you don’t exit a loser. You lose money because you don’t sell winners at the right time. There’s no easy way around it — not knowing when to sell a stock is detrimental to any investing strategy you may have. Here are some key indicators to pay attention to so that you can sell your stock at the right time, along with some examples to pay attention to. One of the most important indicators of when to sell your stock is when there are major changes to the economic outlook. The economy is the driving factor behind most business, and positive economic developments bode well for some companies, and negative economic developments bode well for others. If you think your holdings will perform well, don’t sell. But negative economic factors could seriously impact a company’s earnings, and in turn the company’s share price. The Sequester: The spending cuts initiated by the sequester are going to have a negative effect on consumer spending this summer. With millions of workers facing up to a 20% pay cut, they will just spend less at stores and other retailers. Compound that with rising gas prices, and it’s going to be tough. As such, you may want to be wary of retailers such as Wal-Mart (WMT) and Target (TGT). Rising Interest Rates: Rising interest rates can cause all sorts of financial chaos, as many investors have seen over the last few weeks. Rising interest rates (combined with furloughs) may severely weaken the housing market, and that could negatively impact the economy. Also, higher interest rates have caused problems for mortgage REITs as changes in book value have sent prices dropping. Another key aspect to pay attention to are changes to the underlying business. This is a singular focus on the company you’re invested in, instead of taking a broader economic perspective. Many times, companies get into trouble — legislation that alters business potential, litigation, competition, and more. If you’re a shareholder, you need to pay attention to your company and look at how the business could potentially be changing — for better or for worse. If the reasons you initially invested in the company are no longer present, you may want to sell your stock holding. Computers: Do you remember Hewlett-Packard (HP)? Competition and pricing negatively impacted their business and they couldn’t pivot. If you bought anywhere from 2001 to 2007, you’ve pretty much taken a bath on the company. What about Dell (DELL) now? They are trying to restructure through some type of leveraged buyout, but the real question is, what does the next five years hold for computers and how will Dell set themselves apart? Television: If you’re a Time Warner (TWX) customer, you’ve undoubtedly experienced some type of channel blackout in the past several years. This has been caused by negotiations with the broadcasters over rights to the shows and advertising money. Why does this matter? Well, it doesn’t really because cable is a dying medium as more and more people watch shows online, on DVR, or basically when they want to ad-free. For most cable companies, there has been net subscriber loss to cable services, while internet has been the growing business — something to pay attention to over the next few years. Then, there is always the company that is having poor financial performance. This could be a company that, for whatever reason, saw poor earnings and Wall Street dropped it like a rock in a pond. This one is a tough one, because poor financial performance alone shouldn’t be a reason to sell a company stock. You need to dive deeper: was this a single quarter that was bad, or is it a sign of something bigger (as mentioned above). Remember: every publicly traded company is bound to deliver shareholder value. And typically this is measured by the share price, but many times it’s measured as whether the company meets or beats Wall Street analyst estimates. As such, every company uses every trick in the accounting book to make sure they make their Wall Street estimates. But, if a company knows its going to miss, companies typically go the other way — get rid of all the bad stuff on their books and miss by a lot. So, you really need to do your diligence. Morgan Stanley: If you looked at Morgan Stanley’s (MS) earnings last week, you would have noticed that they used several accounting tricks to boost their earnings to meet Wall Street’s consensus estimates. For example, they lowered their capital reserve for bad loans, saying they saw improvements in the housing market. But, that’s pretty shortsighted. Remember, their top-line earnings were down, so is the economy really improving? That’s what reserves are for! This is something to be very cautious about in the coming months. The bottom line is that you need to be selling stocks when either: the economics that impact the company have changed, or the underlying business that drives the company has changed. There is no “one size fits all” when it comes to reasons to sell your stocks. You need to really think about the reasons why you initially bought the stock, and decide if the company still meets your standards. What reasons do you sell your stocks for? What about ETFs or mutual funds? Don’t over complicate things. Just buy a market index fund and stop trying to time the market. This will make your life so much better and you won’t be stress all the time at what your stocks are doing. I think this is exactly the right response. Even the top professionals struggle to beat market index funds. But wouldn’t you agree the same rules apply to ETFs and index funds? You need to look at your funds from time to time as well. Good analysis and your reasons are exactly why I only deal with mutual funds and ETFs. Unless you have a large enough amount to invest I think small investors should just avoid individual stocks in general. I usually buy and hold! Most of my investments are mutual funds and ETFs. I do own about 5 stocks and very rarely will sell unless there is some significant change in the company. Even if your goal was long term, does it change anything really? Yes, if you buy “XYZ” at $20/share, and it loses money starting tomorrow all the way until the day of your retirement, don’t you think you should have stayed on top of your “long-term” investment goals and sold this at a minimal loss? I think so. Buy and do homework. Fool on! This is one thing I always struggle with. Problem is economy or underlying fundamentals keep on changing. You’ll never no the uptrend or downtrend is going to stay for a while or not. hence selling now or two months down the line always has been a challenge for me. It can be difficult to know when to sell a stock. Since I needed money last year and had to sell off some stocks, I sold all my losers and kept my winners. So far all the winners have stayed winners. I hope it stays that way. I have sector targets and I take profits. I do what is referred to as gradual trading. If a stock goes down and the fundamentals remain, I may add to my position and I also sell some of my position when the stock goes up. Having targets by sector and stock really makes this easy. I usually sell stocks when they cut dividends or do not increase it for some time (usually one or two years with no increase and I am selling). If that happens, then the stock is not performing and I look for a replacement. As a dividend investor the decision making is a lot simplified over investing into growth stocks.